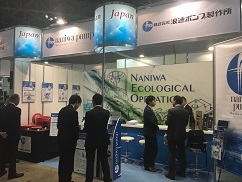 SEAJAPAN 2018 | Naniwa Pump Manufacturing Co., Ltd.
Naniwa Pump Mfg. Co., Ltd. participated at “SEA JAPAN 2018” exhibition in Tokyo, Japan. SEA JAPAN is the largest maritime exhibition in Japan. It is staged every two years, this year for the 13th time. Over 580 companies from 28 countries exhibited and 20,226 visitors were counted after three days. During the last several years Naniwa has been at work developing composite material (FRP) pumps. 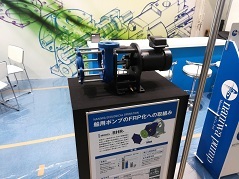 Prototypes – both, vertical and horizontal – centrifugal pumps were exhibited. 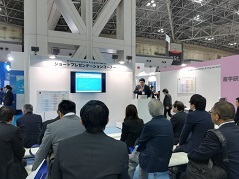 “Remote Abnormality Diagnosis System”, which was attended by a lot of people. 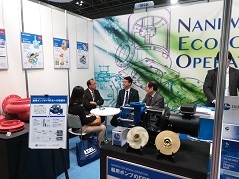 Naniwa continues its quest to reduce weight and to improve maintainability of its pumps, responding to customer requirements in a timely fashion. 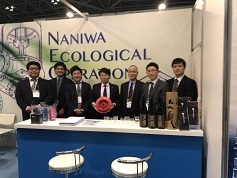 We thank you for visiting Naniwa’s booth and attending our presentation! Naniwa looks forward to serving you!